Just bought a new computer (running Windows Vista home premium). My old computer (running Windows XP professional) is infected with Hacktool.Rootkit. I've tried the Norton fix but to no avail. Rather than dance around it or do "brain surgery" on the computer, I plan to wipe the old computer clean by reformatting the hard drive, and reinstalling operating system and necessary software - I figure I'll have a local computer repair shop do that for me so it gets done right. However, before that, I'd like to transfer some files (pictures, iTunes music library, various documents - MS Word, Excel, Publisher, Adobe PDF, etc.) from the old computer to the new one using my external hard drive. Of course, I want to be sure that I don't end up infecting my new computer by doing this. Any advice on what files to avoid transferring just to be safe? Any advice on how to handle peripherals that may or may not be compromised? I scanned my external hard drive (WD Sync) and Norton didn't find any infected files on it. My other peripherals include an iPod and 3 flash drives. Considering the fact that a new computer is a valuable investment, I can only recommend that you take the appropriate steps to protect it. Rootkits are comprised of many different files. Because you see one, does not mean that is all there are. There are several people on this forum that can help you, if you wish to proceed. Once it is fully identified, it doesn't take too long to remove it. You will be asked to follow the instructions given precisely because those who didn't compromised there operating system. Once the main computer is clean, you will be able to use it to ensure that the peripherals are secure. Only then would I suggest transferring files. Right now I would not transfer anything from the old system or any files from the peripherals to the new system until ALL the rootkits are removed from the old system and the peripherals. When Norton scanned the WD Sync files did it uncompress the files to the original format (a Word document file say) or just look at the uncompressed encrypted file itself? (WD Sync does encrypt the files also.) If you are not sure, don't transfer any of them. Unfortunately, the time to backup files is not after you find your system compromised. If you want help in cleaning your old system so you can safely move the files, there are those here that are very knowledgeable about this and more than willing to help. If you are worried about the "surgery" aspect of this, the only times I have seen this not go smoothly is where the users became impatient and did things on their own. Hacktool.Rootkit comprises a set of programs and scripts that work together to allow attackers to break into a system. If Hacktool.Rootkit is detected on a system, it is very likely that an attacker has gained complete control of that system. All files that are detected as Hacktool.Rootkit should be deleted. Infected systems may need to be restored from backups or patched to restore security. Rootkits first appeared on the UNIX operating system. Administrator/Superuser accounts on UNIX systems are called root. Rootkits are kits of programs that are designed to gain root access on a system. The term rootkit now refers to any set of tools that can be used to gain unauthorized access to a system. Occasionally a rootkit may use legitimate programs or operating system files to carry out part of an attack. These files are not detected as Hacktool.Rootkit. Have you followed the Removal Instructions (below)? Removal Instructions for Hacktool.Rootkit: http://www.symantec.com/security_response/writeup.jsp?docid=2002-011710-0057-99&tabid=3. First of all, let us know which Norton program(name and version) do you have in your new computer. Run LiveUpdate repeatedly until you see the message "No more updates..." and then run a full system scan. This is to make sure that your new computer is free from viruses. Now, go ahead and transfer the files from your old computer to the external harddrive(to a specific folder if possible).Attach the external drive to your new computer. When this removable drive appears under My Computer section, right-click on it and select the option to run a Norton scan. Check the scan results and if it detects any threats, fix/remove those threats. For your old computer, if you have created any system restore points in it using Windows, better try restoring it than going for a complete clean wipe. The user only wanted to know whether or not to transfer files. That has been answered and assistance offered. Since the user has already stated that the repair advice by Symantec did not work, we can assume that the same scans will not work either. Should he require further assistance, he will ask. Realistically speaking, the only scan really required is the GMER. Thanks for the replies everyone! Sounds like I'm right to be concerned about transferring any files from my old computer to my new one, until I get the Hacktool.Rootkit issue fully taken care of. I am interested in getting help. Anyone willing to walk me through it step by step? I did begin an on-line chat on the problem with the Norton techs in India. Apparently, they have the ability to take control of the computer remotely to help with this as well. What would you folks recommend? Info & instructions from the forum community members (like yourselves), or trying to work with the Norton techs? Full scans flag the Hacktool.Rootkit virus and various tracking cookies. There's no fix option for the Hacktool.Rootkit - I clicked "Get Help" and followed the instructions on the Norton website, but to no avail - these steps included, turning off Windows System Restore, rebooting computer in Safe Mode, running full scan, reversing steps on system restore. This didn't resolve the issue, and from what forum members have said, I'm guessing I have to run some other kind of scan to find and delete specific files. P.S. - My new computer is clean, and is also running Norton Internet Security 2009. Any chance I can use my new computer to check and clean my peripherals (WD Sync external hard drive, 3 small flash drives, iPod, Sony Walkman MP3 player) - or should I be 100% careful, and not even plug these into my new computer - i.e., clean the old computer and then use it to check/clean these peripherals. Please provide a GMER log so we can see exactly what we are dealing with. Here's what I got when I ran the gmer software. Let me know if I should attach any of my peripherals and run gmer again to diagnose them. Did you run the GMER with all of the boxes checked? There isn't enough of it there to show a rootkit infection. Are you still getting the warning? NIS2009 has the definitions now to remove this infection. Sorry... I didn't scan it properly the first time with GMER. I just did it again the right way and here's what I got. 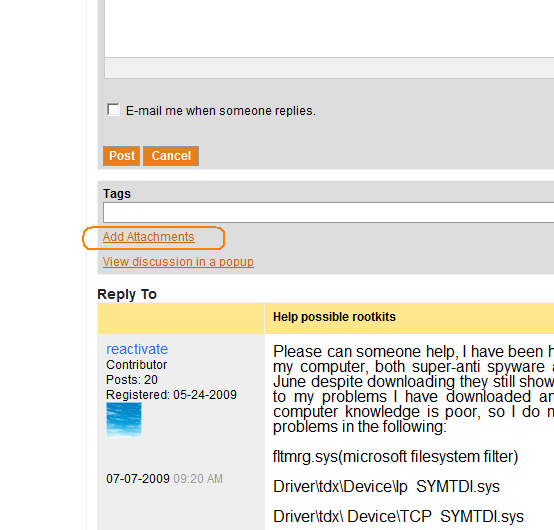 GMER said it did find rootkits. Are the red lines of text the problem areas? I'll wait for your instructions on next step, but should I also attach my peripherals (iPod, Sony MP3 player, 3 flash drives, WD Sync external hard drive), and run GMER on them somehow? **ACTUALLY - what is below is just a portion of the GMER log - the Norton forum text editor said my posting was over 20,000 characters long, so I deleted some lines of the log that didn't seem to indicate anything unusual.
? SYMEFA.SYS The system cannot find the file specified. ! File C:\WINDOWS\SYSTEM32\DRIVERS\wpsxbayy.sys 25088 bytes executable <-- ROOTKIT !!! Service C:\WINDOWS\system32\drivers\wpsxbayy.sys [BOOT] ujypmcpx <-- ROOTKIT !!! Please rum GMER again and this time save the log file as ctd.log. Attach this file to a post here by using the Add Attachments link just below the orange Post button. Please do not edit out any of the log file(s). Thanks for your patience. The log file is attached. Now we have something to work with. Quads will be along later due to time zone differences, and he will help you remove the rootkit. I am working on yours, your registry entries and files don't seem to match but that's ok a bit more of a challenge. Now (read carefully) If you have Spybot S&D uninstall it. Also during the restarts with Avenger if Your PC has a Startup repair center like with HP and Toshiba tell it to start Normally if it kicks in. You will be asked to restart the PC click "Yes", when the PC restarts the load screen will takes slightly longer, then when it looks as though windows is loading the PC will restart again. Then when Windows fully loads the Avenger log will be loaded, showing files it could or could not find. Sorry for the delay in responding. Summer vacation interrupted my follow up. I just followed your instructions - downloaded and ran Avenger with the script from your message. Attached is the Avenger log that resulted. First couple lines says no rootkits found?? Looks like it successfully disabled 1 driver and deleted 1 driver, 1 file, and 1 registry key, but it failed to disable or delete a bunch of others that were in your script. After the computer restarted fully, Norton's autoprotect warning came up saying that a Hacktool.rootkit virus was still detected. Should I run a full Norton virus scan to confirm that the Hacktool.rootkit is still there? What should my next step be? Re-run GMER and send you the new log file? The next instruction to follow is to download, install, update and do a full system scan with Malwarebytes. The rootkit is broken, but the pieces must be removed. There are always extra files in the scripts to cover all the bases. Many of them will show failed if the file does not exist. It does get the ones we want. I downloaded, installed, and updated malwarebytes. I turned off the system restore, then I ran a full malwarebytes scan. It found a bunch of malware, and I told it to delete all of this. Attached is the log file. Feels like progress - THANKS! Is that the last step? Can I turn on my system restore, run a full Norton scan just to be sure, and if clean - declare victory? If yes, then one last question. Any suggestions on how to proceed in scanning my peripheral devices to make sure they are not infected - i.e., WD Sync external hard drive, 3 flash drives, iPod, Sony Walkman MP3 player. Now that your computer is cleaned out, you want to make sure that auto run is turned off in your Windows settings. Make sure Norton is fully updated, turn early load on, set heuristic detection to aggressive, and reboot to get the settings in place. Plug in your peripherals one at a time and run a custom scan on each one. If there are any issues, Norton should be able to handle it. Then you will be good to go. Let us know if you have any issues with it. c:\WINDOWS\SYSTEM32\DRIVERS\seneka.sys (Trojan.Agent) -> Quarantined and deleted successfully. c:\WINDOWS\SYSTEM32\DRIVERS\senekapqipxtny.sys (Trojan.Agent) -> Quarantined and deleted successfully. c:\WINDOWS\SYSTEM32\DRIVERS\senekatqvvdltf.sys (Trojan.Agent) -> Quarantined and deleted successfully. c:\WINDOWS\SYSTEM32\senekamuiyqogq.dat (Trojan.Agent) -> Quarantined and deleted successfully. c:\WINDOWS\SYSTEM32\senekaqwykmtxa.dat (Trojan.Agent) -> Quarantined and deleted successfully. Please Update Malwarebytes and Run a Full Scan again, Why?? With some of the Rootkits and like Vundo, Malwarebytes and Superantispyware say deleted but with another scan it is still there. 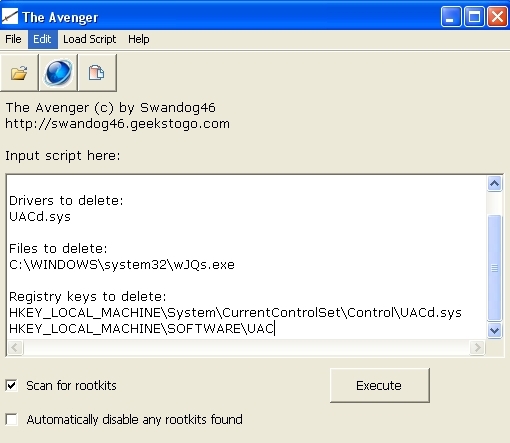 I did the Avenger scan for 2 different Rootkit names, Not Seneka, If it still shows up I will have to create a new script. Gotcha. I'll update Malwarebytes and re-run. If that detects anything I'll delete it and forward the new log file. If it says my computer is clean, I'll follow Delphinium's instructions on scanning my peripherals. I'll use the flash disinfector if I have access issues with my peripherals. Question - how do I turn off the auto run feature in Windows? I assume I should do this, so that any viruses on the peripherals don't have a chance to jump back to my computer when I plug them in. Makes sense, but I don't know how to turn off/on the auto run feature in Windows XP.